Becky Knowles wins Best Picture of February for creating this wonderfully macabre homage to Re-Animator. 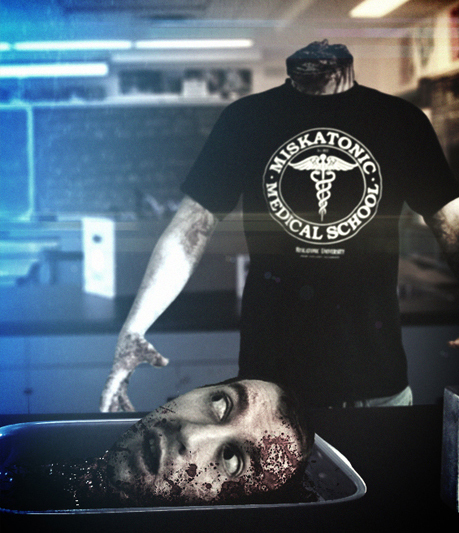 Incorporated into the image is our Miskatonic Medical School T-shirt inspired by the film. Many thanks once again for all entries this month, we appreciate all your efforts and we’ll include some of them into The Gallery If you’d like to have a go at entering our next Best Picture of the Month Competition then please send your photo/image to info@lastexittonowhere.com – All images must have a reference to Last Exit to Nowhere in some way. Winners receive 3 Last Exit to Nowhere T-shirts of their choice!